Candles, once thought to be only romantic in nature, are more prevalent than ever. In various shapes, sizes and scents, candles are used to set a mood as well as, illuminate a room. In addition to candles having various colors, they also are made out of various materials. No longer is simple wax the order of the day in candle making. Candle making materials these days include soy, beeswax and even gels. Differing waxes can prolong the candle’s burn time. As well, storing candles in a freezer also extends the burn life. 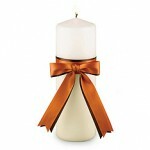 This is an important element to consider when placing tapered candles on the table for a holiday dinner. Caring for candles is typically simple. However there are those occasions when wax spills onto tables and/or table clothes requiring specialized care. Eucalyptus:—Promotes healing; especially good for colds or flu. Lavender:—Brings inner calm and peace, releases one from emotional stress. Sage:—Removes negative energy, powerful clearing and cleansing scent. 2013 is projected to be a great year for giving. Check out the top Christmas gifts this season in our featured gifts section.